The language of folk songs is international and universal. It speaks directly to the human heart of the eternal themes of love and death. It is this aspect which has led many classical composers to seek inspiration in the music of the people, and it is also what attracted this duo. Their aim, like that of the composers, is to achieve a special kind of simplicity, to allow their voices to become instruments reflecting the emotions and tones of different peoples. It is the kind of simplicity which can only be attained through a complex mingling of perfect technique and emotional commitment. This CD is a record of special encounters: of classical composers with the specific folk traditions, of the classically trained singer with other ways of singing. 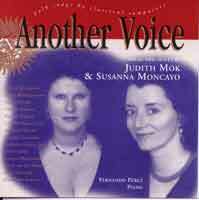 And above all, the encounter of two women, the Dutch soprano Judith Mok and the Argentinean mezzo Susanna Moncayo. Their voices fuse to release a special energy, drawn from the two ends of the earth. This CD is a record of these encounters: Another voice. - Born in Amsterdam, this internationally acclaimed soprano has performed oratorio, lied and opera in many of the major European festivals and halls, working with conductors like Harnoncourt and Edo de Waart. She works with many leading orchestras, and appears often on TV and radio. Judith Mok has made several CDs. She is well known for the broad range of her repertoire which runs from baroque to contemporary music, including works written especially for her. - She started her career singing in the children's choir of the Teatro Colon in her native city of Buenos Aires. She studied song at the National Conservatory of Paris where she was a pupil of Regine Crespin and graduated with First Prize. She also worked with the teachers Giannella Borelli in Rome, Elsa Cavelti in Basilea and Ana Higueras in Madrid. In the Teatro Colon de Buenos Aires she sang Lulu by A.Berg, 'Les Contes de Hoffmann' by J.Offenbach (with Alfredo Kraus) and 'Faust' by C.Gounod. In the Concertgebouw of Amsterdam, 'La Donna del Lago' by G.Rossini. In the Philharmonic of Bratislava (Slovakia), 'Pelleas et Melisande', by C.Debussy. In the Festival of Strasbourg the world premiere of 'La Rosa de Ariadna', by G.Dazzi, directed by S.Braunschweig. She has given concerts in Spain, France, Italy, Germany, Switzerland, Poland, Columbia and Argentina. She has been soloist with the Symphony Orchestra of Pays de La Loire and she has toured France with the Symphony Orchestra of Crakow, singing Mozart arias. Her recordings include the 'Requiem' by J.A.Hasse, conducted by Paul Dombrecht, which was then presented at the Festival de Musica Antigua de Ambronay (France), and A.Vivaldi's 'Beatus Vir', a world premiere in the Basilica de San Marco in Venice, and in the Midem at Cannes, (France). She has also recorded a compilation of lullabies and an anthology of songs written to texts by great Latin American poets. - Born in Buenos Aires. Studied at the Conservatorio Nacional of Bueonos Aires and at the Facultad de Artes y Ciencias Musicales de la Universidad Catolica Argentina. He participated in classes and masterclasses of Menahem Pressler and Lazar Berman, among others. He has won important national prizes, including First Prize in the 'Concurso Bienal Mozart' of the Asociacion Festivales de Buenos Aires (1991). In his native country he is considered by the critics to be one the leading chamber musicians, and he has also performed often as soloist in other Latin American countries. He has recorded 2 CDs with the 'Sinfonietta Omega' conducted by the composer Gerardo Gandini, both as soloist and chamber musician. Since 1990 he performs regularly as soloist in the Teatro Colon of Buenos Aires, in performances of 20th century works and premieres by Argentinean composers.